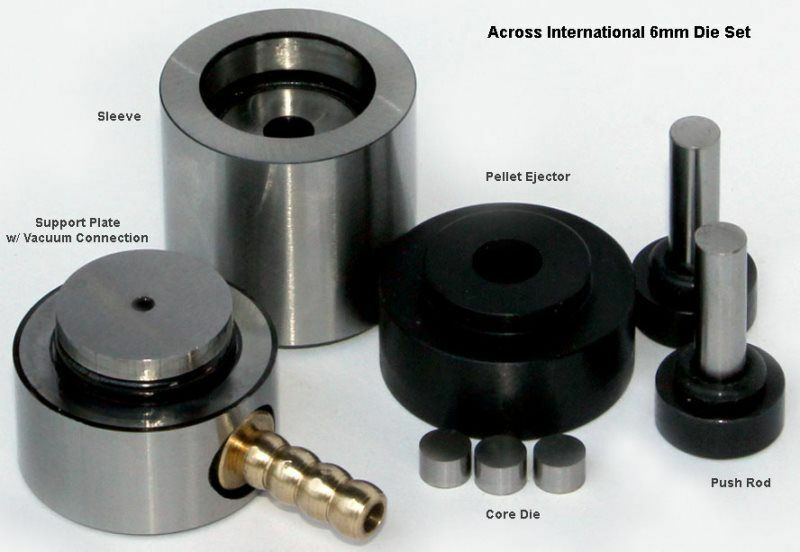 A set of 6mm diameter (ID) hardened steel dry vacuum pressing die set for pellet presses, ready for you to make 6mm diameter cylinder-shape pellets in a vacuum condition. Never fill the die more than 1/3 its sleeve height with your sample and do not apply pressure beyond 4 tons. Across International is not responsible for any damage caused by misuse. 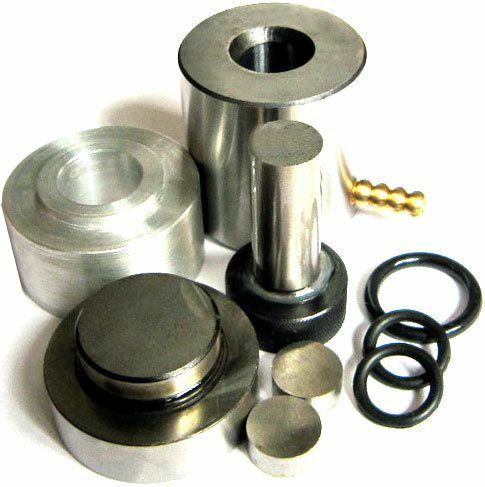 A set of 13mm diameter (ID) hardened steel dry vacuum pressing die set for pellet presses, ready for you to make 13mm diameter cylinder-shape pellets in a vacuum condition. 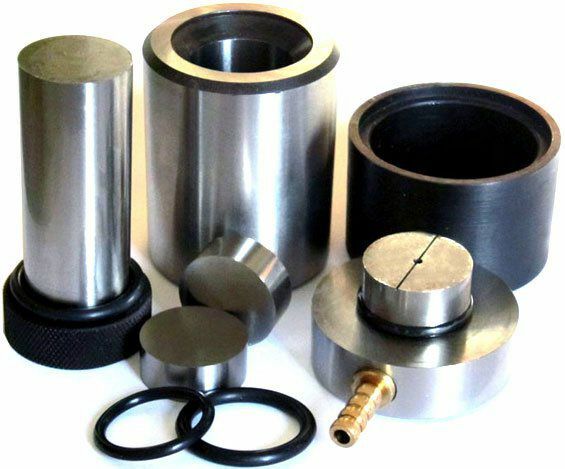 A set of 25mm diameter (ID) hardened steel dry vacuum pressing die set for pellet presses, ready for you to make 25mm diameter cylinder-shape pellets in a vacuum condition. Never fill the die more than 1/3 its sleeve height with your sample and do not apply pressure beyond 30 tons. Across International is not responsible for any damage caused by misuse. 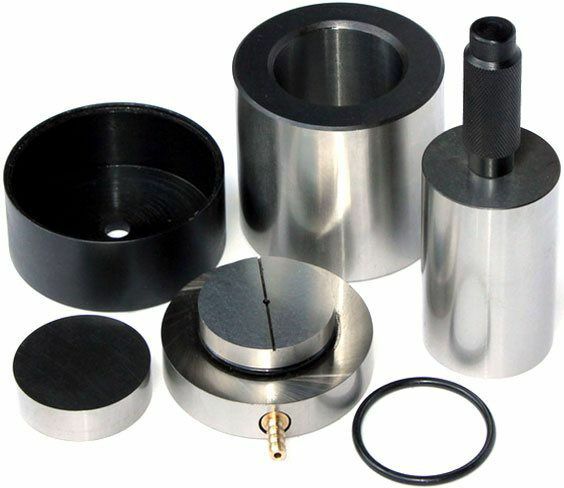 A set of 50mm diameter (ID) hardened steel dry vacuum pressing die set for pellet presses, ready for you to make 50mm diameter cylinder-shape pellets in a vacuum condition. Never fill the die more than 1/3 its sleeve height with your sample and do not apply pressure beyond 100 tons. Across International is not responsible for any damage caused by misuse.